If you are going to have a wood fired central heating system then there are a few things to consider first. Heating with wood is not quite the same as using a gas or oil boiler. You need to have enough space for a decent size, well ventilated, wood shed where the firewood can be stored in the dry. If you want to provide a large proportion of the heating and hot water needs of your home with a boiler stove then this shed should be able to hold a fair volume of wood. You do not want to have to have firewood deliveries every week. A capacity of 2-3 meters cubed might be sufficient depending on your predicted consumption. You will need to regularly take wood from this shed to your stove so the less far you have to walk to get from the shed to the stove the better. 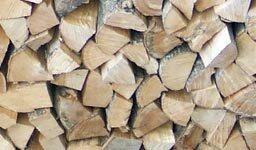 Having a smaller log pile in the room near the stove is a very practical solution which means you can use wood from the pile on a day to day basis and then fill up the pile as and when needed. I personally like the activity involved in stocking up my wood pile and the fact that I physically feed the fuel into the stove to keep it burning. This makes you more aware of the energy you use for heating and hot water in your home, which gives you a greater incentive to conserve this energy if at all possible, for example by draught proofing or adding extra insulation to your house. If you are providing hot water from your stove then remember that you may need to pre-empt your water use to some extent. For example if you have only just got home and the stove is not lit then you will probably need to light the stove and have it running for at least an hour before you can run a bath. You soon get used to this form of hot water eating, but it is not as on demand as, for example, a gas combi boiler. Using a heat accumulator tank can get around this by storing up heat for use whenever you need it.